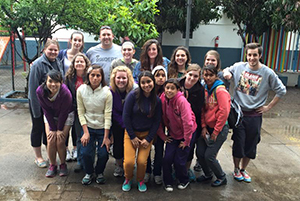 UIU Alternative Spring Break participants pose with local residents at an orphanage playground in Tlaquepaque, Mexico. The UIU students and staff include Sam Huey Shien Leow, Carol Langerman-Aten, Ashten Wolff, Emily Marvin, Hannah Myers, Bet Bofill Llacer, Daryl Grove, Sarah TerHark, Maria Lujan Fuster, Julia Chueiri Genovezzi, Tonya Saddoris, and Roberto Mardones. From the daily struggle of the homeless in Denver, Colo., to the aspiring developments in the infrastructure of Tlaquepaque, Mexico, Upper Iowa University students and staff experienced different cultures and helped serve the communities during 2015 Alternative Spring Break. While in Colorado, the volunteers helped serve at various homeless shelters along with viewing the social environment of downtown Denver. There were different hypothetical situations that the group was introduced to as well. One of the residents they talked to was previously homeless in Denver after he achieved two bachelors and a master’s degree. “This really put it into perspective that I could graduate college and find myself without a place to live in a city like Denver because of the living expenses. It was a shock to see the life of the homeless and what they have to go through on a daily basis,” said Adrienne Staton, a UIU student on the trip. “It was awesome and it made me think about what it would be like to live out there compared to here in Iowa,” noted Paige Dietel, graduate assistant for UIU student activities. Two of the Alternative Spring Break student leaders, Jacob Baumhover and Kaylee Schwake were able to help spearhead some of the activities, which had a strong impact with the other students on the trips. “My favorite service part was working with the elderly at Bessie’s Hope. We visited people who don’t have anyone to come see them and we kept them company while we were there,” said Schwake. “I enjoyed cooking breakfast and the lunch for the residents of the shelters when we first arrived in Denver. The group of people that went made the experience even better,” added Baumhover. Meanwhile, UIU staff members/chaperones Daryl Grove and Carol Langerman-Aten were joined by student leaders Roberto Mardones and Hannah Myers, and a handful of additional students in participating in the Tlaquepaque, Mexico, Alternative Spring Break. Grove, UIU’s assistant dean of students and director of student leadership and adventure, explained that Tlaquepaque is a suburb of Guadalajara. An artisan community, the Mexican city has a well-developed infrastructure and is continuing to expand. As part of the Tlaquepaque adventure, the participants were introduced to the culture and daily life of the local residents. “The hospitality of the Rotary Club in Tlaquepaque was unbelievable. No matter what time it was, they were always willing to drive our group around. Every time they saw us they were really excited and happy that the group was there to help. I loved every minute of it and would go back in a heartbeat,” reported Myers. When talking about his experience, Mardones said, “Everyone treated us like family and the culture was very friendly. They wanted us to come back to visit, that’s just how friendly everyone was. We have a new vacation spot if we would like to come back to Tlaquepaque. I had a blast and our group had a great time together. Similar to those attending the Denver trip, there were many opportunities for the UIU family to participate in community projects around Tlaquepaque. Emily Marvin, Peacocks for Progress president, was among the student volunteers to visit both an active Tlaquepaque orphanage and another currently under construction. While attending the functioning orphanage, the group provided assistance in the baby room and played with the other children. In addition to visiting the two orphanages, the Tlaquepaque team attended classes at a new school, installed a water filtering system in a drug rehabilitation center, and helped paint portions of a nursing home and a center for abused women. For more information please contact Daryl Grove at Groved@uiu.edu.